BBQ season is here and if you like spice and flavor, here is a great dish. 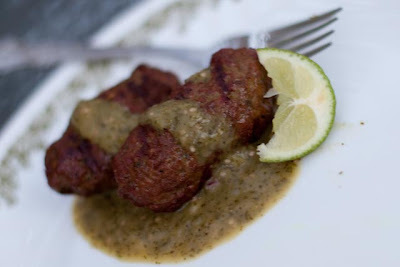 Spicy Lamb Kabobs with a refreshing Mint Chutney. Both extremely easy to make and great for a quick meal. I usually make the chutney the day before, but if you like, you could even make it several days ahead and freeze it. As for the kabobs, i like to get all the spice into the ground lamb the day before I'm going to make them just so the meat gets enough time to get all the flavors in. These come out tender and juicy and are just great to eat while they are hot. Enjoy the recipe! 2) You can either skewer them or roll them into kabobs using your hand and cook it on the BBQ or grill in the oven. Do not overcook or it'll get dry. Because there's enough fat in the meat, you don't need to baste it at all. 1) Chop up the tomatillos, onion and chili and cook in a large pan with lid on until all the ingredients are soft and tender. Be sure to stir the ingredients a few time while cooking. 2) Place the cooked ingredients in a blender with chopped cilantro, mint and salt and blend until pureed. Add some water if chutney is too thick. 3) Empty out Chutney in a bowl and add in Vinegar and small chopped onions. Mix and let it chill for 2 to 3 hrs. Serve when ready.